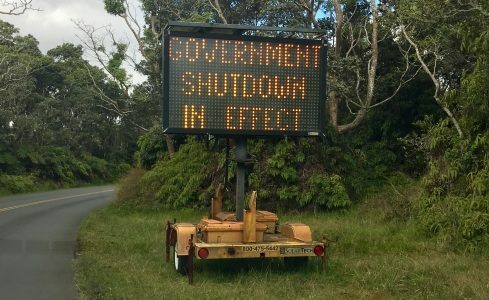 The effects of the recent government shutdown—now the longest in U.S. federal history at the time of this writing—have reverberated deeply throughout the country. Whether people have been directly affected through their employment with furloughs, or indirectly through a slowdown or halting of government services, the ceasing of functioning government has left an indelible impression among the American public. To the latent observer, however, one might wonder why so many tribal communities are dependent on the federal government for these public services. Why, if these Native nations are, in fact, “sovereign,” is there such reliance on the federal government? The brief, but ever-so-complex answer is treaties. In exchange for large swaths of Native land, the federal government promised tribes services such as healthcare, and now the IHS is responsible for the care of over two million Native Americans and Alaska Natives. The federal government’s track record in honoring treaties with Native American tribes is rather dismal, but notwithstanding, it is because of these federal trust responsibilities that numerous tribes are still heavily reliant on federal government services. The sovereignty discussion, however, merely puts the decisionmaking in the hands of tribal councils and governments, recognizing their autonomy as a self-governing body. Comparing tribes and their self-generated revenues, however, can be a slippery slope. In short, no two tribes are alike economically. It is well known across these communities that IHS is not well funded, and many tribes already look to other funding sources—usually their own—in order to supplement healthcare needs. Wealthier tribes with healthier reserves are likelier to remedy this with some ease, but smaller, poorer tribes are taking a greater hit, and it is likely to have lasting effects for some time to come. But isn’t it only a partial shutdown, you ask? Well, yes. The appropriations bill for Labor, Health and Human Services, and Education was passed with $180 billion appropriated for fiscal year 2019. So, what’s the complication? Isn’t IHS part of the Department of Health and Human Services (HHS)? Well, also yes. IHS is an operating division of HHS. But further complicating matters is the fact that IHS is funded through the Department of the Interior, whose $35.2 billion appropriations bill, along with six other bills were not passed. While IHS providers are continuing to provide the services they can without pay, according to HHS’s Contingency Staffing Plan, IHS “would be unable to provide the majority of funds to Tribes and Urban Indian Health programs.” In short, the partial shutdown has had very tangible effects in these Native communities. In a December 2018 PA Times column, Lorinda Riley called for more incorporation of tribal governance into public administration education. I did the same in a 2011 PAR article. For those of us in the field actively working to do so, it’s a start, but the unfortunate occurrence of the government shutdown and its potentially deleterious effects on the country, and Native communities in particular, provides a renewed opportunity for scholars and practitioners to better understand how the over 570 federally recognized tribes interact with the federal government. This year the Bureau of Indian Affairs will mark its 195th year of existence, making it one of the oldest federal government agencies in the United States. The history is certainly there, but a focus on contemporary indigenous affairs within our field is more than merited. If we as practitioners and researchers of public administration are serious about social equity being a fourth pillar of the field, we must be mindful of these issues and actively promote them in scholarship and lest the foundation upon which the pillar stands becomes less balanced. Author: John C. Ronquillo is assistant professor of nonprofit and public management at the University of Colorado Denver School of Public Affairs where he teaches courses in leadership and ethics, social entrepreneurship, organizational behavior, and public management. His research interests are in indigenous governance and leadership, and social and organizational innovation. He can be reached at [email protected] or on Twitter @johnron.